Ferguson Businesses Struggle To Rebuild Post-Riots Last year, many businesses in Ferguson, Mo., were looted and vandalized in unrest that gripped the city. Customers are starting to return, but some owners don't feel positive about staying here. Businesses in Ferguson, Mo., are bracing as the city prepares for peaceful protests marking the first anniversary since it was embroiled in violence following the death of 18-year-old Michael Brown. Brown was unarmed when he was shot by a police officer on Aug. 9. 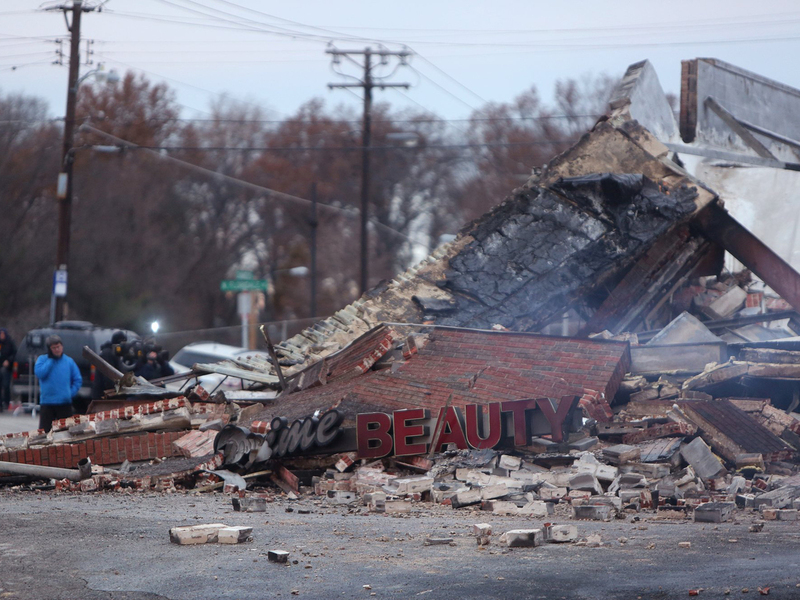 In November, many businesses were looted, vandalized and set on fire after a grand jury decided to not indict Wilson. Since then businesses have been working to rebuild. There are two main business districts in Ferguson, one in the downtown area along North and South Florissant Avenue, and the other on West Florissant, not far from where Brown was killed by then-police officer Darren Wilson. Along West Florissant Avenue, there are some empty lots where once thriving businesses were located. Five buildings in Ferguson and several more in neighboring Dellwood were set on fire during the unrest after Brown's death. Nearly all have been demolished and most are being rebuilt. Sheila Sweeney, interim CEO of the St. Louis Economic Development Partnership, points out barbershops, cellphone stores and others that suffered less damage. "I think there's a general sense of growth that most of them feel. Some are still obviously in need of assistance and a customer base is kind of starting to grow back, and it's all going forward," Sweeney says. The partnership, banks and the state have given about $750,000 to more than 70 businesses in the region — either grants or loans — some at zero percent interest. St. Louis County is funding a matching grant program to help businesses pay the cost of fixing up their facades. The smoldering remains of a beauty supply store in Ferguson, Mo., in November. Unrest gripped the city after a grand jury decided not to indict police officer Darren Wilson in the shooting death of Michael Brown. 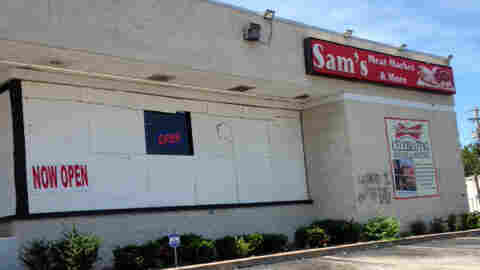 At Sam's Meat Market, there's an open sign out front, but the owner doesn't want to talk. The grocery store sits back off the road. It was looted and vandalized at least three times during the unrest. Marquess Mull, who often cleans the floors of area businesses, says he expected the market to reopen after it was looted the first time. "But the second and third time, woo, it could take a lot out of a person," Mull says. "I know it took a lot out of him just to really come back and get that mindset to come back, but this store is definitely important to the community." But others don't feel as positive about doing business in Ferguson. Dionneshea Forland has been in business for 10 years running Missouri Home Health and Therapy out of an office building on West Florrisant. She had to move out last August and again in November. Vandals stole computers and office furniture. Her clientele dropped because therapists weren't comfortable coming to the area. Her client base is slowly growing, but Forland is still moving out. "I think businesses are having a hard time with coming back to where they were at before the incident happened," Forland says. "I think the visual when you ride down West Florissant is not a good visual." So Ferguson will not fail, and we will rise out of the ashes from a riot not because we have this great idea, but because we are surrounded by economic development. Jerome Jenkins, diner owner in Ferguson, Mo. Ferguson Mayor James Knowles says the city is making progress and even attracting new business. He says perceptions about West Florissant are caused in part by people he says are taking advantage of a situation. "It's very difficult when you have a group of 30 kids that show up on the lot of McDonald's scream, yell, intimidate people, scare people and claim it's their right to do it, and it has nothing to do with any movement," he says. Knowles says the good news is that Ferguson will have more businesses overall than last year — among them, a call center that a managed health care company plans to open, creating up to 200 jobs. And Starbucks will locate a shop on West Florissant. Jerome Jenkins, who owns a diner called Cathy's Kitchen in downtown Ferguson, says the crowds are good at breakfast and lunch but it's slower at night. "People still unsure if they should come out after 5," he says. While some may view Ferguson as a city scarred by violence, Jenkins calls it a goldmine. "So Ferguson will not fail, and we will rise out of the ashes from a riot not because we have this great idea but because we are surrounded by economic development," he says. Other business leaders say they just want people to recognize all the work that's been done in the past year to help bring the community back.